This luxury, spacious 2 bedroom, 2 bathroom (full en suite with bath and shower and second bathroom with large shower), corner unit is on the 16th floor with panoramic views of Table Mountain. The fully equipped kitchen has all the appliances for self-catering, the bedrooms have King size extra length beds and the lounge has ceiling-to-floor windows and Juliette balcony from which the views can be enjoyed and a flat screen TV with satellite and surround sound. There is a bureau with broadband internet (Wifi) connection and dining facilities for 4 people. Self Catering Apartment Accommodation in Cape Town City Bowl, Western Cape, South Africa, close to the V&A Waterfront, Kloof street restaurants, parliament, museums and the company gardens. Stone throw away from the Cape Town International Convention Centre. The Two Oceans Aquarium as well as boat / marine slipway located at the V & A Waterfront. Sight seeing boat trips and the Robben Island ferry can be booked from the Clock tower daily. The apartments have fully equipped kitchens with dishwasher, washing machine, microwave etc. Flat screen television with DStv (compact bouquet) in the lounge and FREE WIFI, uncapped is available.. Gym facilities and swimming pool are located in the building as well as private secure parking bays. 1 allocated parking bay per apartment at no cost. Private entrance with 24hr security on duty. My son is actually the owner, I look after the apartment for him. Senior Citizen, 70+. Maritime background with plenty of traveling since early 1960's Grew up in The Netherlands. First visited Cape Town in 1964, and finally settled here in 1994. It's the sight of Table Mountain, and the history of South Africa that made me decide to settle here. This is a Juliette type balcony, no seating. The balcony is a Juliette type. The Safe is laptop size Free Wifi, Uncapped. 1 allocated parking bay in the basement of the building , no charge. Only Visa or Master credit cards acceptable. I stayed a week at this beautiful apartment with a friend and we thoroughly enjoyed our stay. The apartment is spacious, clean and has beautiful views onto Table Mountain. The apartment is conveniently situated in the city center, close to the Hop-On/Hop-Off Bus stop at Longstreet. Although we never met the landlord (Steve) in person, he always responded promptly and concisely to email requests and the key handover worked seamesly. We would definitely stay there again. The apartment is in a good location (5 minutes from the train station and Adderley bus stop which serves most of the bus lines of Cape Town) with a Woolworth supermarket across the road from the apartment block. fantastic view of table mountain from the living room. The apartment is quiet, very spacious, well equipped and furnished to a high standard. A friend and I rented the apartment but it can easily accommodate 4 adults. A parking space was available for use. Checking in and out was easily. Communications with the owner Steve was great and he was flexible and accommodating to our requirements. I would definitely rent this apartment if I ever return to Cape Town. Great downtown location with plenty of good restaurants nearby. View of Table Mountain is amazing. Parking space in the garage was really beneficial. The whole apartment is maintained to a high standard with all the equipment you will need - very convenient to have a washer/dryer. Plenty of space for a family of four to stay in comfort. Steve made the check-in and check-out smooth and easy. Highly recommended - we would love to visit again! It was a real pleasure to host the Tracey family, good communication. They were very active, and on the move all the time to visit as many sites of interest as possible. Left the apartment clean and tidy. Welcome again. Steve has to be the nicest, most accommodating, kindest host out there. My young kid and I stayed there coming from L.A. and had a great time The apartment was impeccable, easy walking or uber to everything, close to food shops and rental car places. We had a wonderful stay and considering coming back soon! Thank you Steve! The stay was fantastic. Steve and Karen were fantastic hosts, the apartment is immaculate and the view of Table Mountain cannot be beat. This apartment was very comfortable, clean and convenient for center city. Having the parking garage was really helpful. We explored everywhere around the city and out into the countryside from this great location. Stellenbach, Cape of Good Hope, Robben Island. We managed the water crisis with help from the owners. It did not disrupt our stay at all. Terrific view of Table Top Mountain! Nice to walk Company Gardens only a block away. Thank you Martha, it was a pleasure having you. You were great guests and looked after the apartment as if it were your own, we would gladly welcome you back. Self catering accommodation, Western Cape, Cape Town, City Bowl. The Western Cape is one of the most attractive parts of South Africa for international travelers. From historic wine lands and beaches to Table Mountain the landscape and scenery of the Cape is spectacular. This includes its own floral kingdom, the Fynbos, which is one of the world's smallest yet most diverse floral kingdoms and is home to the national flower, the Protea. In particular what makes the Cape so attractive is its beautiful long warm summer days (making it a perfect escape from the European winter) and the tremendous diversity of activities that you can indulge in while on holiday. 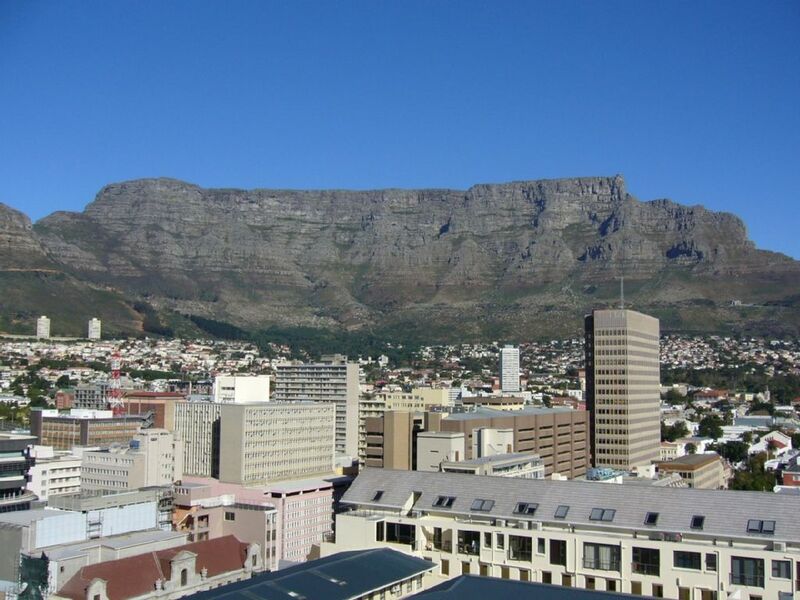 Nestled under Table Mountain and with panoramic views of Devils Peak and Signal Hill the Cape Town City Bowl is at the heart of everything that the Western Cape has to offer. It is the historic and cultural centre of the region. Rates are subject to change without notice. For bookings of 7 nights and more discounts are applicable , please enquire owner. Cancellation Policy. From 60 days plus, forfeits 25% of deposit (i.e. 12.5% of total price) From 30 to 60 days, forfeits 50% of deposit (i.e. 25% of total price) and less than 30days, forfeits the full deposit.